In 2018 we introduced the all inflatable non-motorised Unicorn Ride for childrens parties but while popular with children we ended up with lots of disappointed adults who wanted a Unicorn ride for their own party! 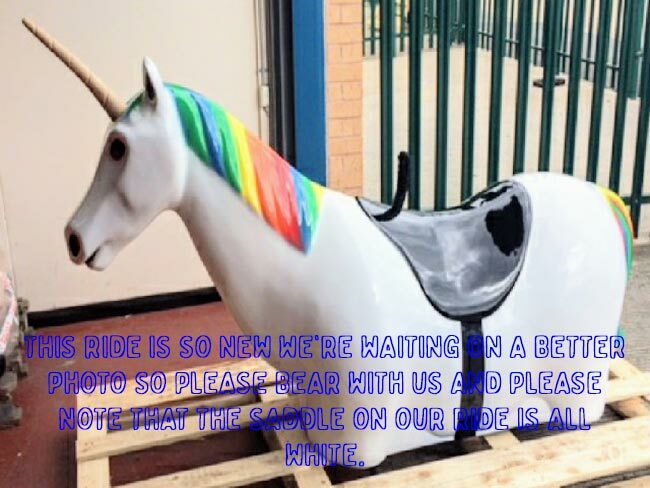 Well, we listened and new for Spring 2019 is our custom made mechanical Rodeo Unicorn Ride suitable for riders age 7 to adult! No longer are Unicorn parties just for the kids with our new custom made Rodeo Unicorn ride - and its suitable for adults! In fact anyone 4ft tall upwards can ride it. The speed of the bucks and spin are completely controlled by the trained operator so it can go at anything from a gentle leisurely ride to a bucking spinning guaranteed fall off in 5 seconds! Each ride length is automatically timed with the duration shown on a large timer display. We'll even provide a small trophy for the best time of the event. This Unicorn ride is supplied with a trained operator. Unstaffed hire is not available. The motorised Rodeo Unicorn Ride will need a space of 18x18ft and a height clearance of 9ft if used indoors. If outdoors then we will supply an inflatable weather shelter to go over the top and that needs an increased area of 23x23ft. A mains electric supply is required but we can supply a suitable generator at additional cost for outdoor events where theres no power available. This fabulous inflatable Unicorn ride is brand new to the UK so almost as hard to find as a real unicorn and has to be the must have entertainment for any little girls party. The brightly coloured Unicorn is fully inflatable and is rocked back and forth and side to side via four tug straps until the rider falls off on to the mattress or their ride time is up. The ride is suitable for riders up to 40kg in weight - sorry, its not suitable for adults. The Unicorn ride requires an overall operating area of 20x20ft and this needs to be flat. It can be used both indoors and outdoors. If your party is outdoors we can provide an inflatable weather shelter for a small additional charge but that increases the area required to 23x23ft. Access to mains electric is required within 50metres although we can provide a generator at additional cost where this isn't possible. If you have any queries, questions, or would like to book our inflatable unicorn for your party please click here to enquire and we will do all we can to help.